Coffee sourced from Vietnam + California sweetened condensed milk = a delectable treat anytime, anywhere. 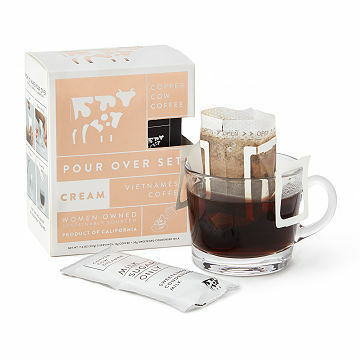 To craft her pour-over kit, Debbie Mullin sampled over 40 different coffee suppliers in Vietnam before landing on the aromatic beans from the country's central highlands. And we're thrilled about the delectable, creamy results. Vietnamese coffee is a blend of rich coffee and sweetened condensed milk. Now, you can satisfy your craving on-the-go with her portable, small-batch ingredients. Start by anchoring the origami-style pouch to your mug, then slowly filter hot water through three to five times. Next, add your choice amount of sweetened condensed milk, stir, sip, and savor. With no tools required, just think about all the places you can enjoy this treat: Mountaintops (preferred), hotel rooms (take that, bad hotel coffee), and the office (post-meeting treat). Coffee sourced from Vietnam. Milk and sugar from California. It is the perfect gift for our son who was just in Vietnam. I got this for the office, but I want to take camping too! Perfect for making Cafe Sua Da whenever, where ever, easily. I have the small press to make it at home, but this is perfect for in my office and taking with me camping. Super tasty coffee. Sadly the pouch did not hold to the edges of the mug, so it fell in, spilling coffee grounds inside. After sorting that out with a pour-over device and another mug, it was enjoyable! It is so good, I need to buy it by the pound!! My husband uses these portable coffee brewers while he's flying commercial planes. He gets so many comments on what a great idea they are. Many flight attendants have asked about how to get these. The flavor is amazing and the sweetened condensed milk packet that comes with the coffee is a perfect pair! These taste just like a fresh brewed cup of coffee....no instant coffee taste here! High Quality Coffee - ANYWHERE! The origami design that allows you to brew coffee instantly, is simply genius! You can immediately smell the fresh roasted coffee as you start to pour the hot water. Stir in as little or as much as you want of the silky condensed milk to liken your taste for sweetness.Copper Cow's quality beats office blends and certainly the coffee chain brews. I keep CCC in the office and gift to office staff who love it as well! I bought a box of these as stocking stuffers for my coffee-loving family members. I had to try it myself it be sure. Delicious and fun to make. Ideal for people who want great coffee but are off in the woods, up a mountain, or somewhere else away from home. Copper Cow is so good that we tend to reserve it for special occasions or as a treat. Having lived in Vietnam, we cultivated a real love for their coffee but found it difficult to access here. Now, the problem is solved and we look forward to drinking Copper Cow with its delightful origami packet for many years to come. The product makes a great holiday gift. I wish it was morning just so I could have another cup! I drink this coffee leisurely but also when I have major deadlines and have long days. Copper Cow is what gets me through the project and I go to sleep looking forward to my next cup! I gifted a box to my friend in architecture school as well, knowing that he spends sleepless nights at studio!